In order to address challenges that lie ahead a modern diplomat has to acquire a wide and comprehensive knowledge of international affairs as well as a set of skills necessary for functioning in international environment. Postgraduate Program in Diplomacy run jointly by the European Academy of Diplomacy and the Polish Naval Academy builds on previous experience and academic achievements of the candidates to equip them with professional skills and competencies necessary for those who want to pursue a career in diplomacy. It places equal emphasis on both academic and practical aspects of diplomacy, hones intercultural and communication skills, provides extensive knowledge of both traditional and non-traditional diplomacy. The program is addressed to students, mid-career professionals and full professional staff from the international business, diplomatic, third sector, military and administration. 1. Studies last two semesters (160 hours). 2. First semester takes place in the Polish Naval Academy in Gdynia. 3. Second semester takes place in European Academy of Diplomacy in Warsaw. 4. Language of lecture: English. 6. Studies end with the release of a joint postgraduate diploma of Polish Naval Academy and European Academy of Diplomacy. Since its inception in 2004 and with over 3000 graduates from more than 40 countries, EAD offers the highest quality tailor-made programs at graduate, post-graduate and executive levels. Renowned for its teaching methods, international faculty and distinguished speakers, the EAD prepares diplomats, civil servants, political and social leaders, as well as representatives of businesses, academia and the non-governmental sector for the challenges of a globalizing and ever changing world. 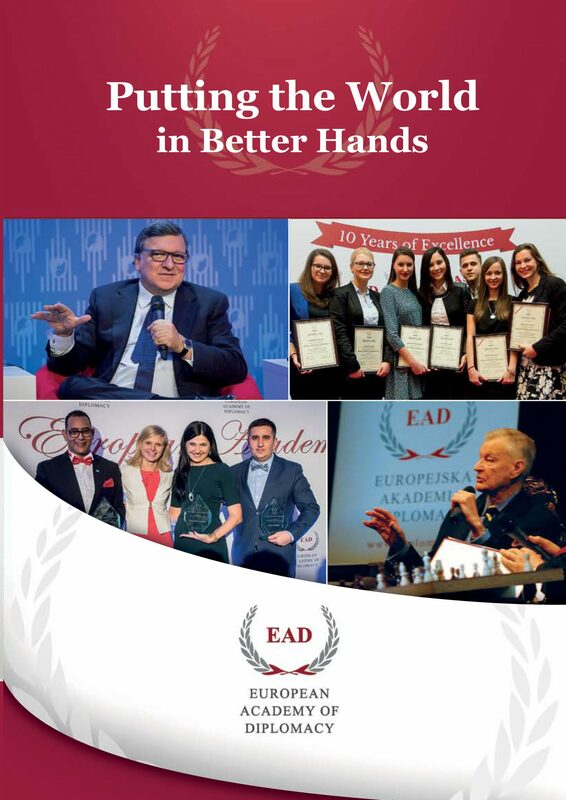 We invite you to learn more about EAD, where passion for our mission, commitment to international dialogue and a personal approach to all our students and partners are the trademarks of our activities. The Naval Academy Faculty of Humanities and Social Sciences aims at people who are devoted to the modern world and its dynamics. Students who choose our programs will be able to gain knowledge in globalization, international security, world history, modern political systems and the foundations of economy. After graduation students will have acquired a huge variety of skills and abilities, such as: analyzing political phenomena and effective support of decision making processes of international organizations. Dynamic changes in the international relations, current conflicts and intensified globalization prompt international and economic enterprises to require experts who master that kind of knowledge. The faculty as part the Polish Naval Academy constitutes a part of the system of public service education dedicated to people who take interest in special nursery- education, resocialization or prophylactic of care and upbringing. They student will be able to employed in institutions like: community centre for children and for adults, educational institution and centers and take part in pedagogical therapy. Moreover, they can look for a job in local government institutions and educational administration. 1. Overall charge: 7.800,00 PLN or 1850 EURO. 2. Payment by instalments: 2 x 4.200,00 PLN or 975 EURO. 3. The fee includes 160 hours of training, materials, lunches, coffee breaks and diploma. 4. Student in signing an agreement with PAN and EAD. 5. To apply on the postgraduate study, please complete the registration form. 6. After completing the form via e-mail you will receive information about payment and contract. Is accommodation included in the fee? No. However, upon your acceptance to the program, the European Academy of Diplomacy and the Polish Naval Academy will recommend a variety of reasonably priced accommodation option in the vicinity of the premises of the European Academy of Diplomacy and the Polish Naval Academy. What is included in fee? The fee includes 160 hours of training, materials, lunches, coffee breaks and diploma. European Academy of Diplomacy and Polish Naval Academy will organize lunches and coffee breaks in the training venues. How can I get to Polish Naval Academy in Gdynia? From city center we recomend you taxi or BUS no 150. From other cities like Sopot, Gdańsk or Rumia you have to go SKM (city train) to Gdynia Główna station and then take a taxi or BUS no 150. How can I get to the European Academy of Diplomacy? ul. Oleandrow is located exactly in between these tram stops. The currency in Poland is the Polish Złoty (PLN) 1 PLN = 100 groszy. Coins circulate in denominations of 1 PLN, 2 PLN, 5 PLN and 10, 20 and 50 groszy; banknotes are in denominations of 10, 20, 50, 100 and 200 PLN. In some larger stores, such as hypermarkets, and at some cash-only windows, you can pay in Euros. You must notify the cashier that you will be paying in Euros, but note that it is not a popular currency in Poland yet, and chances are that your change will be given in PLN. The current exchange rate is roughly 1 Euro = 4.4 pln. Currency should be exchanged at a registered exchange center. There is no commission for the exchange. Although dress is informal for the majority of the program, formal attire is expected for the graduation ceremony.